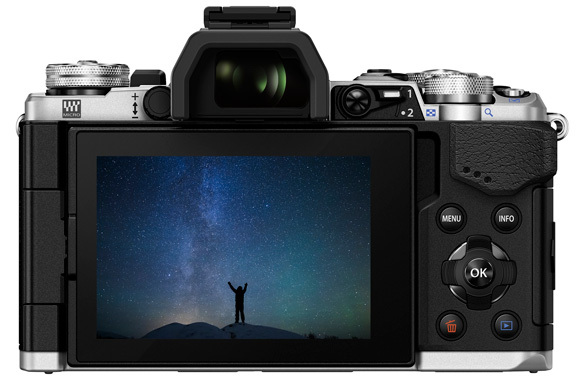 The new E-M5 II has been improved for better handling, with more customizable function buttons, while keeping the classic retro styling of the button placement and control layout of the earlier version. So how do you follow a classic? That’s the dilemma Olympus engineers faced following the undisputed success of their original E-M5 mirrorless hybrid camera. Boasting outstanding build quality, retro styling, 5-axis sensor shift image stabilization, and a 16Mp 4/3 sensor, it was at the time the king of mirrorless hybrids. That was three years ago, though, and a lot has changed in the mirrorless market since then, with manufacturers such as Sony and Samsung releasing hybrids with high-resolution APS-C sensors that start to make the original E-M5 look a little long in the tooth. 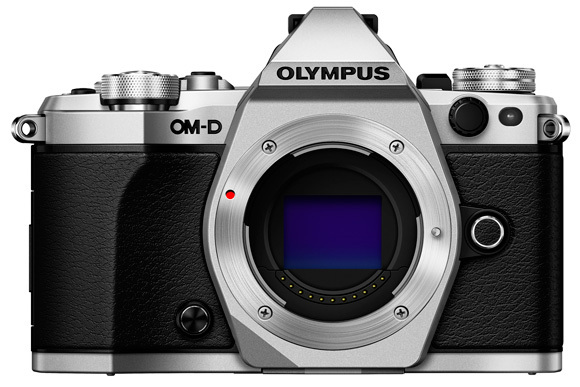 So out comes the new Olympus E-M5 II, and at first glance it appears that not much has changed. The new model continues to use a similar, if not the same, 16Mp 4/3 sensor, together with a similar retro styling and top-end build quality to make the shell fully weatherproof. So what is new? Well, for starters, both the built-in Electronic Viewfinder (EVF) and rear LCD screen have been overhauled, making them much more usable. The EVF now features a beefier 2.4m-dot resolution and the new 3.0-inch vari-angle LCD touchscreen also boasts an increased 1.04m-dot resolution, with swivel and tilt functions to assist with framing video or still shots from tricky positions. The original E-M5 unveiled the world’s first 5-axis image stabilization system — that’s a sensor shift solution that moves the sensor across 5 different axes to counteract the effects of camera shake. Well, the same system remains on the updated E-M5 II, but now Olympus is claiming that it offers the world’s most powerful image stabilization system too — up to 5 stops of stabilization across both still and video capture. To put that into some context, if you’re shooting stills with long telephoto lenses, say the equivalent of 600mm (taking account the Olympus 2x “crop factor”), then 5 stops of image stabilization will enable you to use slow shutter speeds around 1/20th sec and still get sharp shots of relatively static subjects. Five stops is at least one stop more than most of its rivals, and being a sensor shift image stabilization solution, it will work with all Olympus 40+ ZUIKO lenses that can be attached to the Olympus E-M5 II. The sensor shift system has also given rise to a new 40Mp super-high-resolution stitching mode on the new Olympus E-M5 II. By moving the sensor during a continuous burst of 8 frames and stitching the images together in-camera, the E-M5 II can output a 40Mp file. That’s pretty impressive in terms of enthusiast cameras, outdoing both the 36Mp Nikon D800 and the Sony A7R, and surpassed only by Canon’s new 50Mp 5DS. How well the stitch mode copes with a moving subject remains to be seen — not very well, probably, but if you’re after high resolution shots of still subjects and can use a tripod, it should give some impressive results. Add to all this Full HD video capture at a range of frame rates including 60/24 fps, the same TruePic VII image processing engine from Olympus’s flagship E-M1 camera, built-in wi-fi, and an 81-point autofocus system, the new Olympus OMD E-M5 II has more about it than first impressions suggest. Yes, some enthusiasts may be frustrated that there isn’t a new higher resolution sensor to challenge the 20 Mp+ options from Sony and Samsung, but the E-M5 looks to have many other charms that will make it hard to resist. Available from late February 2015, the OM-D E-M5 Mark II is priced at around $1200, body only, or $1500 including the 12-50 mm kit lens. With all cameras using a 16Mp 4/3 sensor, the DxOMark Sensor Scores for the E-M1, E-M10 and E-M5 all hover around the 70-point mark, which is respectable for a mirrorless camera. 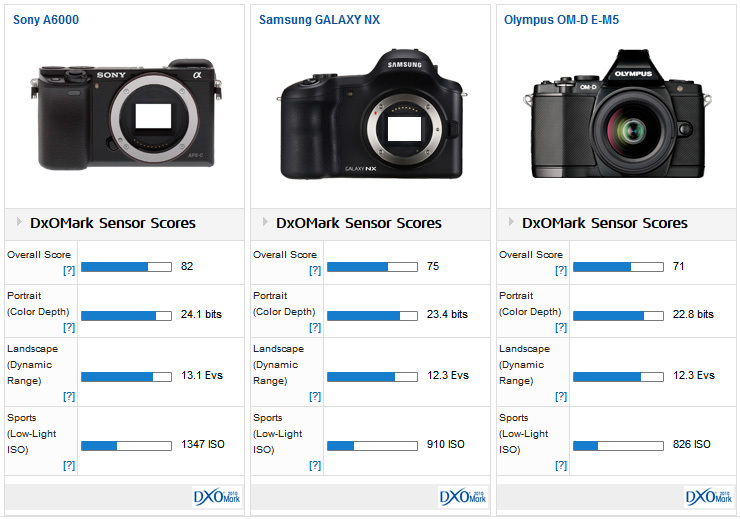 71 points for the original E-M5 is a little off the pace compared to the 24Mp sensor in the class-leading Sony A6000, but holds its own against the higher-resolution Samsung NX.